Working with MIDI as means of controlling other software is near impossible without this function as you often need to trigger an off-signal before triggering an on-signal from the same event source, and it will surely be beneficial in other scenarios as well. Do you mean like this? — where each time you sent an event to the Increment/Toggle port, the output would be routed to the next output port on Select Output? and it will surely be beneficial in other scenarios as well. Any thoughts on what those other scenarios would be? It works, but it is a bit more cluttery, and doesn't really convey the ordering of events in a straightforward manner. The order module from Reaktor has one input and three outputs. It executes the full node path for the first output, before triggering the next one and so on. The most appealing thing about it is that it is very neat, and you know exactly what is going to happen. 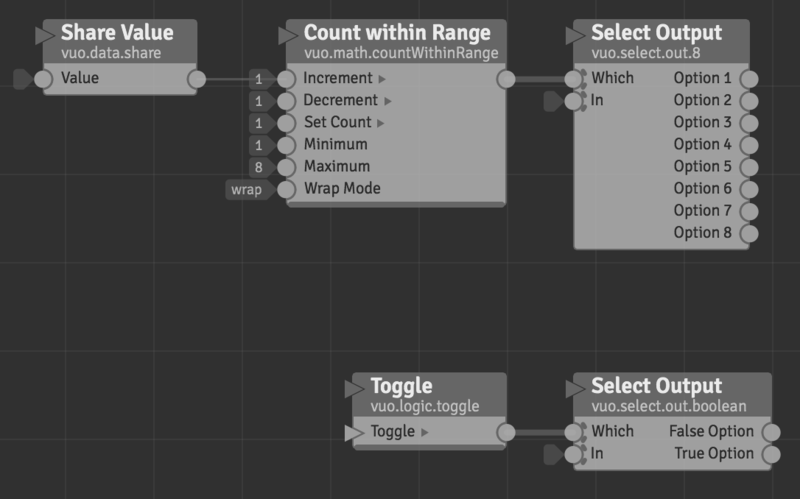 I have in the same composition that the picture is from a bunch of the Count Within Range nodes, Select Input nodes and a lot of extra conditionals that wouldn't be needed if there was an order module. I guess the main difference would be to be able to tell Vuo to first do this, then this, and finally this - instead of do this this and this. It might be my earlier experience with NI Reaktor that really wants an order module. Aha, your request makes more sense to me after reading https://www.native-instruments.com/en/support/knowledge-base/show/24/how... . Thanks for elaborating.